Calling a halt to mindless change – 13 years on, have we learnt the lesson yet? It was a sad day this week, when I learnt of the death of an old colleague, John Macdonald. This isn’t an obituary, there are times and places for those, but I would like to reflect on one of his key messages. In ‘retirement’, John was an author and speaker, and it was as a speaker that I first met him. We were both ‘on the platform’ at a series of conferences in India, organised by their Institute of Directors. We soon discovered that we shared the same publisher too. Several of John’s writing projects in the 1990s were books in the “Successful Business in a Week” series sponsored by the Institute of Management – I lost count of how many titles he contributed. Earlier in his life, he had been involved in local politics but much of his work was in the field of quality – quality improvement, quality management, and total quality management. He ran the Philip Crosby organisation in the UK and, perhaps as a result, was a proponent of a systems and procedural approach to organisational change. Over dinner at several conferences, we bounced different interpretations of these themes around. He understood the ethology and behavioural approach that was my background, but insisted that the technological of his own was of higher priority. We didn’t differ, we complemented, and I believe that the Indian audiences enjoyed this contrasting perspective – possibly more so than UK and European ones did. On one of these trips, John’s baggage was mislaid by British Airways, and so he used it as an excuse to have a distinctive suit made by an Indian tailor in less than 24hrs. A few months later, I heard him address a UK conference on the lessons we could learn from India on ‘just-in-time’ manufacturing. He warned the delegates that if they failed to move with the times they would soon witness an Indian takeover of British industry just as the Japanese had a few years before. How right he proved to be. John’s seminal work, though, was still to come. 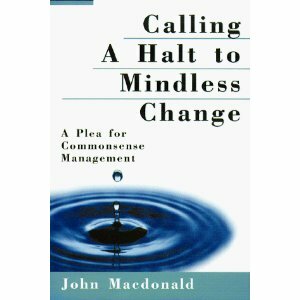 In 1998, his book; “Calling a Halt to Mindless Change: A Plea for Commonsense Management” was published by AMACOM. For a while it achieved celebrity status, and he was interviewed on radio and TV, and did a speaking tour or two off the back of it. His thesis was essentially captured in the title. However, it needs a little unwrapping. After a working lifetime of promoting change, he was not suggesting that change initiatives should stop. Nor was he suggesting that all such programmes were ‘mindless’. What he was challenging was the degree of understanding and focus that many organisations had before they instituted the latest shift. We had often swapped stories of the Boards that began a process and then failed to follow through – usually because they were so keen to begin that they hadn’t really understood where they were going, and what the inevitable consequences would be, before they started. As a result, they got frightened and drew back. Sometimes, of course, it was too late – in fact, usually it was too late. The decision to change had already been a last ditch attempt, though many would deny it, and when the scale of the effort that was needed became apparent they would fear what outsiders might say – especially the financial analysts – they would look for a face-saving opt out. In the last few months, we have heard politicians promoting change in the NHS, in the military, in the police, the judiciary, and the coastguard – not to forget their demands for change in the Civil Service as a whole. We’ve heard them baying for change in the media, banking and financial sectors. Under pressure to deliver results, these pronouncements have usually been followed by a commission of one kind or another, a hurried report full of ambiguities – generally leaked ahead of publication, and then an event that proved the vulnerability of the Nation should any change actually happen. I am not suggesting that this is purely a political or governmental issue – there are, I am sure, plenty of commercial enterprises that are reorganising, reinventing, or just reviewing, as I write this column. This all leaves me wondering whether anyone has learnt John’s essential lesson and whether change processes are any more enlightened than they were 13 years ago? Dr Graham Wilson is an organisational psychotherapist who works as a confidant to people in positions of power helping them understand company psychodynamics, unfolding situations, politics, and their own and other people’s behaviour. His latest book is “The Senior Executive’s Emergency Job Hunt“. Previous Article← Cultivating ‘gravitas’ – What is spirituality?